Designed with autonomic computing features -- self-management, self-healing, self-configuring and self-optimising capabilities -- and leveraging the reliability and performance of Linux, Nitix was a revolutionary server operating system that sets new standards in stability, security, affordability and ease-of-use. Working with existing environments (such as Microsoft or Novell), or as a complete IT infrastructure replacement, Nitix was easier to manage and use than traditional server operating systems resulting in an affordable and simplified IT infrastructure. Nitix provides a complete business server solution with messaging and collaboration, security-enhanced Internet access and protected data storage. Unique technologies and innovative management tools make it easy to provide secure and reliable IT infrastructure solutions. Rate this project Version 26.0 of 4MLinux, a minimalist distribution for desktops (with JWM) and servers (with the complete LAMP stack), has been released. The project's latest stable build comes with upgraded packages as well as support for modern image and video encoding: "The status of the 4MLinux 26.0 series has been changed to stable. Edit your documents with LibreOffice 6.1.0 and GNOME Office (AbiWord 3.0.2, GIMP 2.10.6, Gnumeric 1.12.43), share your files using DropBox 55.4.171, surf the Internet with Firefox 61.0.2 and Chromium 68.0.3440.75, stay in touch with your friends via Thunderbird 52.9.1 and Skype for Web, enjoy your music collection with Audacious 3.10, watch your favorite videos with VLC 3.0.3 and mpv 0.28.2, play games powered by Mesa 17.3.7 and Wine 3.14. You can also setup the 4MLinux LAMP Server (Linux 4.14.64, Apache 2.4.34, MariaDB 10.3.9, PHP 5.6.37 and PHP 7.2.9). Perl 5.26.1, Python 2.7.14 and Python 3.6.4 are also available. 4MLinux 26.0 comes with some new features: Tcl/Tk (with a collection of small games) has been integrated into 4MLinux, Engrampa (archive manager) is finally able to open Debian packages, Git in 4MLinux has now both GUI and cgit web interface...." Continue to the release announcement for more details. Download (MD5) (pkglist): 4MLinux-26.0-32bit.iso (1,184MB), 4MServer-26.0-64bit.iso (1,253MB). 4MLinux 27.0 has been released. 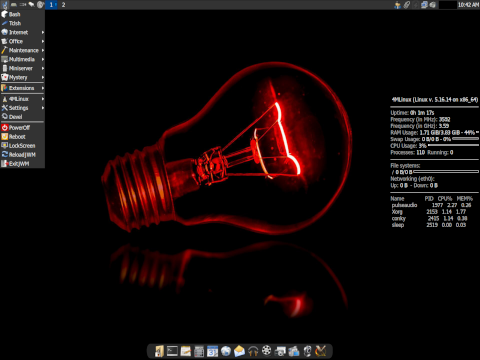 4MLinux is a project building a set of Linux distributions for desktops (with JWM, 32-bit only) and servers (with the complete LAMP stack, 64-bit). The new version comes with assorted improvements on the multimedia and gaming fronts: "The status of the 4MLinux 27.0 series has been changed to STABLE. As always, the new major release has some new features: optional support for AV1 video coding (encoding via FFmpeg and decoding via VLC and mpv), an option to disable PulseAudio with one click (important for those who use 4MLinux to play classic video games such as DOOM), better support for display drivers when 4MLinux is running in KVM (important for those who use a VNC client to manage 4MServer). LazPaint (small yet powerfull raster image editor with layers) and Blender (professional 3D computer graphics software) have been added as downloadable extensions. Additionally, some good news for gamers: more engines available for XBoard (GNU Chess, GNU Shogi, Fairy-Max) as well as more video games to play (Duke3D, Liero, Strifle). A few small terminal-based games have been added, too." Here is the brief release announcement. 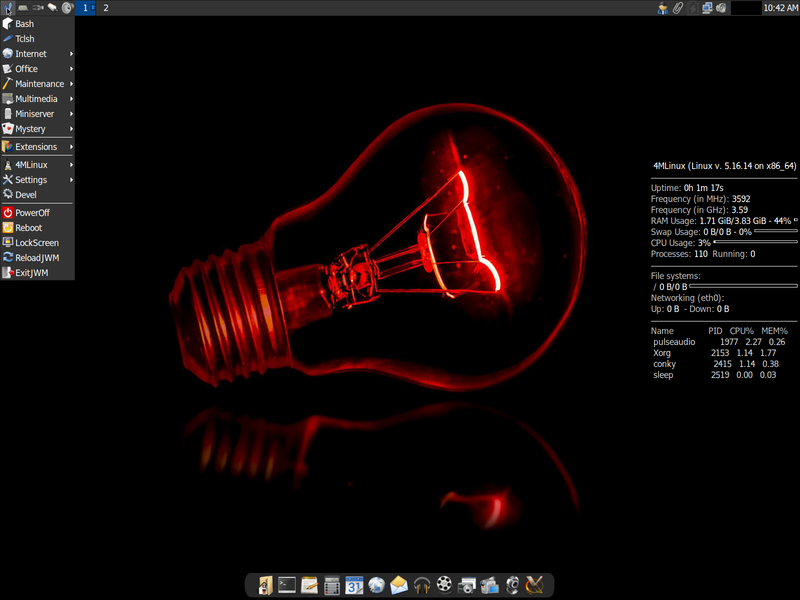 Download (MD5, pkglist): 4MLinux-27.0-32bit.iso (1,136MB), 4MServer-27.0-64bit.iso (1,207MB).